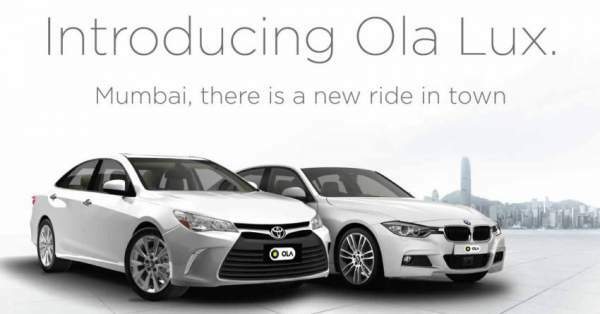 First of all, this service by Ola has been started in South Mumbai. It will be soon launched in some other important parts of the nation like Delhi and Bangalore. After that, it will be made nationwide. The fleet for this segment will have luxury sedans like Jaguar, Mercedes, Audi, BMW, Fortuner, Accord and some others. All these above mentioned sedans will be available for booking at a minimum fare of Rs. 200 and Rs. 19 per kilometer as stated by the company itself in an official announcement. Adding to its charge, the total cost will also include a ride time of Rs. 2 per minute. Now, the Bengaluru based company has started targeting the high-end segment. Earlier, in March 2016, the company had launched its cost-effective/cheapest category segment ‘Micro.’ It was aimed to target price-sensitive customers who are able to afford low fare. The firm aimed it to make its fare lower than auto-rickshaws. The company stated that this service has already been expanded to 75 cities across the nation within just seven weeks of release. The features of Ola Lux includes SOS buttons, AutoConnect Wifi, live tracking and seamless payment using OlaMoney. Also, the driver details will be available with ease. Earlier, Uber tried its hands on Uber BLACK. But, this plan of the company went in vain as it didn’t get that much demand to continue. Thus, this plan got shut down. Uber said that people want to enjoy cost-effective rides for short trips.